Hop on to a stand up paddle board (SUP) and get swept away in the fun and challenge of cruising down the Clutha River.An interactive gentle adventure for those with little or no SUP experience. You’ll soon feel like you are flying as you float atop the crystal clear water. 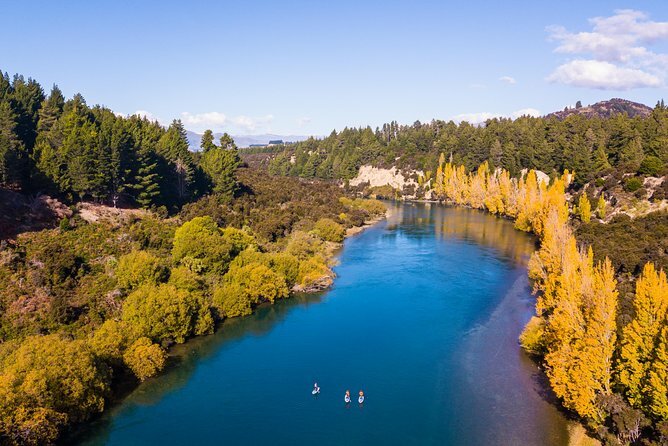 You'll start with a flat water session before heading into the river with a couple of small rapids along the way add to the excitement in a truly exclusive Wanaka adventure.A unique introductory guided tour of the Clutha River. All equipment provided. Your tour will begin at the Outlet Camping Ground. Here you will be geared up & given a full safety briefing - then your journey begins!